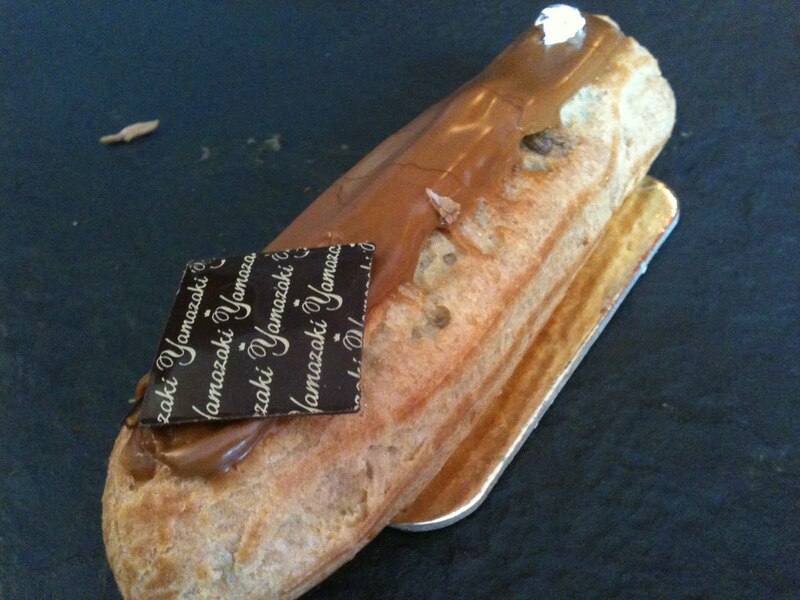 raids pâtisseries: Where to find the best coffee eclair in Paris ? 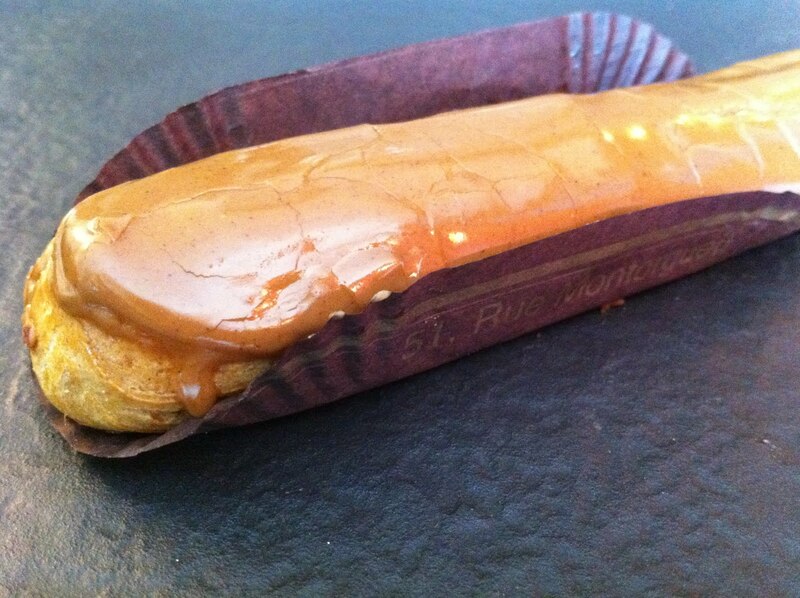 3 tempting cakes were particularly outstanding: Raoul Maeder, Ladurée, Sucrécacao coffee cream puff. Special thanks to the courageous tasters who criss-crossed Paris searching for cream puffs and about to suffer from indigestion: Bertrand, Jeff, Aliénor, Caroline, Kevin, and Laure. Caroline, our favourite food reporter activist, took most of the pictures. 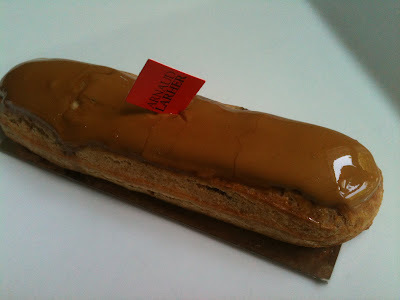 On the whole, it was not easy to find a well-balanced cake between coffee and puff dough flavours. Nor to find pleasant textures with firmness, both melting (cream) and firm (puff dough). Neither to find refreshing ideas and innovation (except for the Pâtisserie des Rêves). 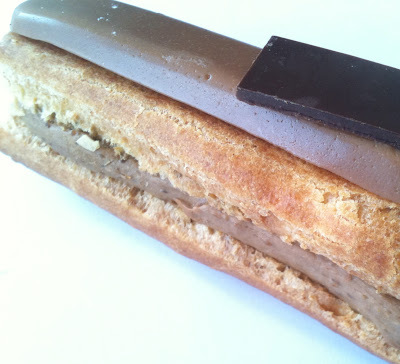 The bad news is that Fauchon no longer bake coffee éclairs. Both delicious and good value, which is not often the case in Paris. Beautiful too, thanks to its shiny icing, its “ribbed outline”, and its generous size. 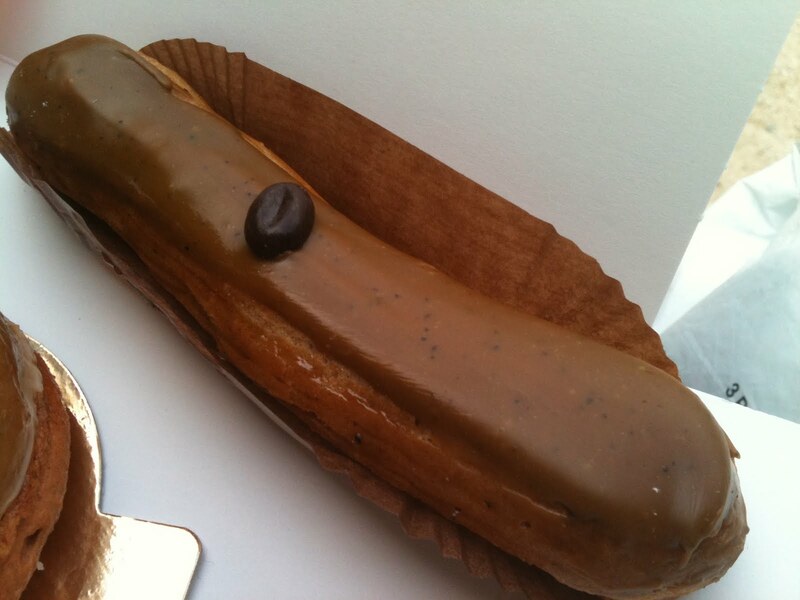 This éclair is also generously filled with coffee confectioner’s custard. The taste is a great balance between its yolk taste (from the puff dough) and the coffee flavour which remains pretty mild. 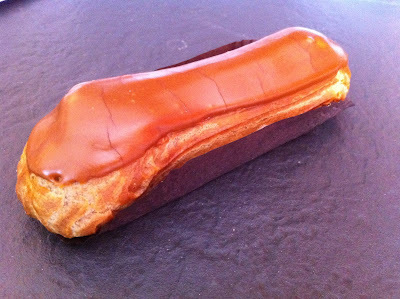 Our first impression was wrong: OK, this éclair really looks dull (mat icing, non cosmetic holes at both ends for the filling…). Yet, it exhales a fine, fresh and salty aroma. And the coffee cream just had a perfect taste of freshly roasted Arabica coffee beans. It is definitely subtle and well-balanced. Yet, the puff dough taste is discrete. 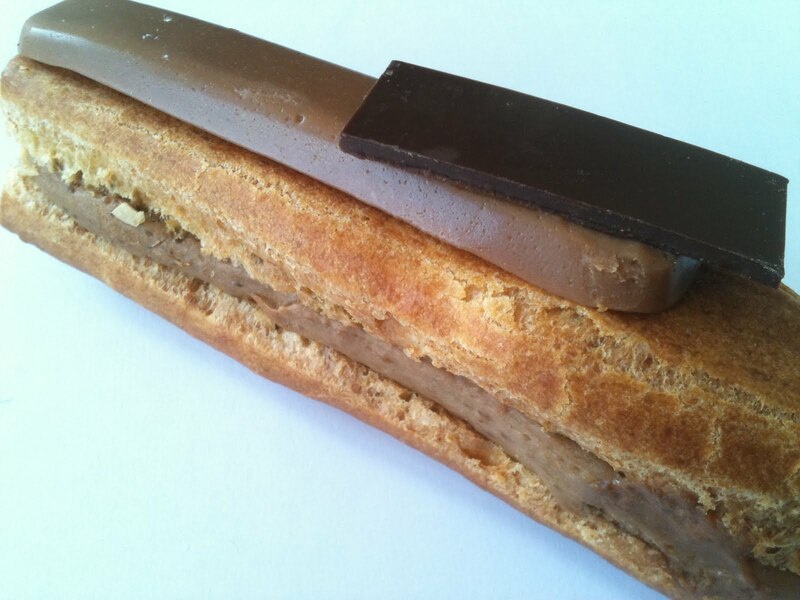 A pleasure for the palate, but not necessarily for the eyes with its “sandwich figure”. The coffee cream really delighted us: generous, great aroma, balanced, with a surprisingly foaming, thick, and almost « dry » texture. 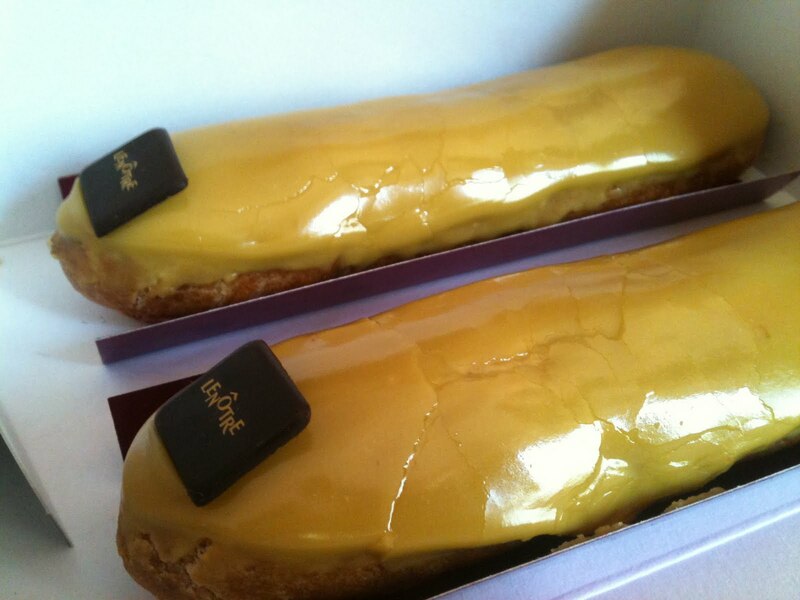 The éclair also was sweet-scented. A nice sweet taste is left on the palate thanks to a full-bodied piece of chocolate and to the coffee icing (too thick by the way). A nice and glossy éclair. The puff dough tastes very good, and is well baked. Yet, the coffee flavour is too strong in the confectioner’s custard. A “chubby” éclair with a great fudge-coloured icing. The puff dough is slightly salted (which is nice) but its texture is too soft. Furthermore, the coffee cream is too bitter in my opinion (a little bit like Robusta coffee). A generous yet "messy looking” patisserie. Nice and fine coffee aroma. Flavourful and firm puff dough. Creamy custard. Yet, the coffee taste is too light. 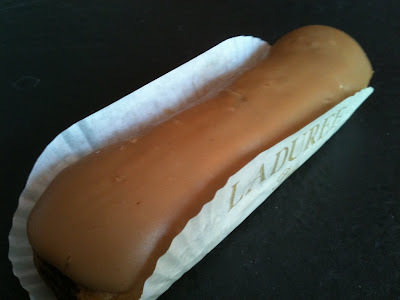 A very harmonious éclair, with nice black dots (vanilla, coffee?) found on the icing. The puff dough has been well baked (I love the roasted flour taste), “well ribbed”, but the texture is too soft. The confectioner’s custard is “fluid” yet bitter. This éclair is the most beautiful and innovative of our benchmark, elegantly wrapped in its milk chocolate sheet. Yet, the coffee flavour was too bitter, despite the (sweet and salty) “chocolaty touch”. The puff dough is firm. As for the chocolate sheet texture, it was difficult to assess it due to a very warm ambient temperature. 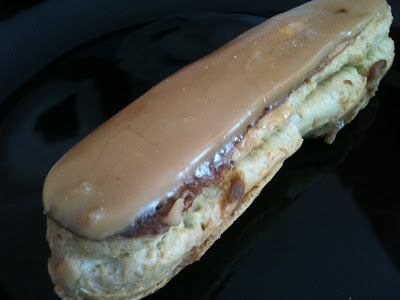 A beautiful yet frustrating éclair. It is indeed very stingily filled with confectioner’s custard which has a very light coffee flavour. Also it is not very sweet. This French-Japanese éclair has an elegant outline, being highlighted by a delightful silver sheet. The “ribbed” outline looks regular. Nevertheless, the dough is too soft. 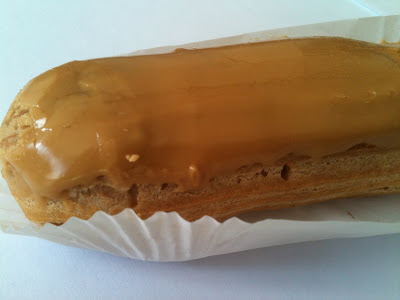 Although the texture of the custard is great, it is too bitter and leaves an unpleasant after-taste. The greenish icing puzzled us at first. Then we were seduced by the awesome textures: the dough was well baked and the custard very fluid. 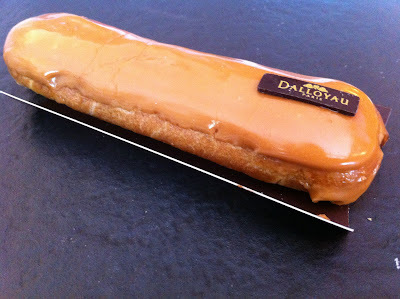 Yet, this patisserie is too salty and bitter. 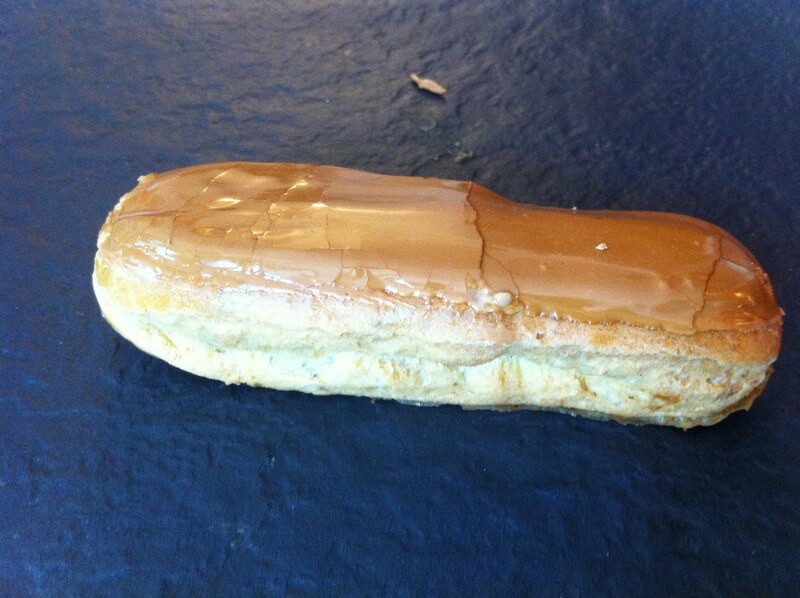 A very slim and poorly filled éclair. 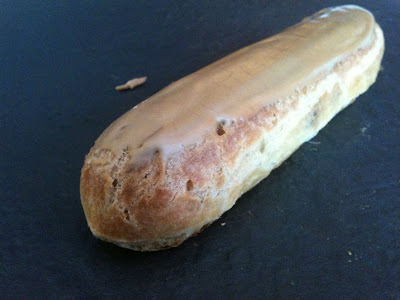 The custard is thin but its taste appears a little “floury”. Moreover, the strong and bitter coffee flavour bothered many of us (imagine you are drinking a Robusta coffee). 13. 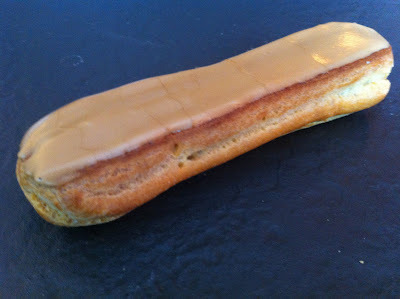 Carton *** A very thin éclair that was generously filled, quite the opposite of the Moulin de la Vierge. It melted pleasantly in the mouth. Interestingly we were surprised by a sort of liquor after-taste of the coffee confectioner’s custard. A very simple and “straight to the point” appearance: shiny and ribbed, as well as a pleasant custard texture. The downside is that the custard flavour is dull and excessively sweet. Visually it is a disaster: messy icing, asymmetrical figure, horizontally sliced for the filling). It has little taste and is very dry. 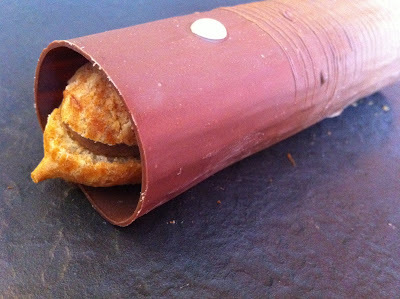 We guess this was an unusual hiccup from this renowned baker.